It is hard to believe it is already Monday. Weekends always seem to fly by. This week is going to be a busy one. I have a lot of appointments and meetings schedules out of the office and I am heading to a training on Wednesday. One item that I will be getting a lot of use out of this week is a black blazer. I consider black blazers to be one of workhorses in my closet. It is versatile, classic, and because it is black it goes with basically everything I own. A high-end black blazer is one of the components of the perfect suit which I said last week is one of the 5 Investment Pieces every woman should have work. Over the years I have also picked up several inexpensive black blazers that I toss over everything including trousers, dresses, jeans, and skirts. I have learned the hard way to I always keep a black blazer in my office. This lesson was learned one hectic day when I was scheduled to looking at dusty books out of the office all day doing research but was called and given almost no notice of an important meeting I had to attend in the office that day. I have almost a 90 minute commute to work each day so I had no time to go home and get dressed. Instead I ran like a mad woman around town to purchase something to wear to this meeting. Since that day along with a few other items a black blazer is something I always keep stashed away in my closet at work for an emergency or when something unexpected pops up. 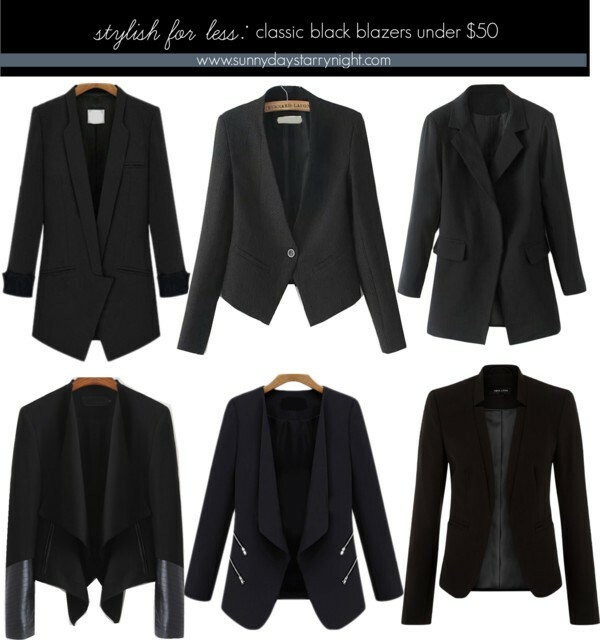 Love how versatile black blazers are, my favourites are the first one, and the one with the leather details. Hello from Spain: I really like the blazers, they are very trendy. Keep in touch.